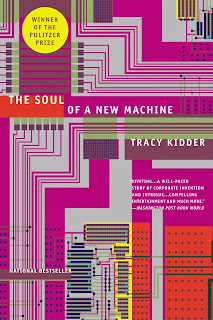 I just finished The Soul of a New Machine by John Tracy Kidder. In short, I loved it!Computers have changed since 1981, when Tracy Kidder memorably recorded the drama, comedy, and excitement of one companys efforts to bring a new microcomputer to market. What has not changed is the feverish pace of the high-tech industry, the go-for-broke approach to business that has caused so many computer companies to win big (or go belly up), and the cult of pursuing mind-bending technological innovations. The Soul of a New Machine is an essential chapter in the history of the machine that revolutionized the world in the twentieth century.This is an oldie, but a goodie. It even won the Pulitzer prize. The whole drama is still very relevant today. It reminded me a lot of Hackers: Heroes of the Computer Revolution and Steve Jobs' biography. It definitely had elements of both, so if you enjoyed those, you'll definitely enjoy this one.